I am a hat fiend. I love hats like no other accessory. Give me the choice of a necklace at Tiffany and a stellar hat and I’d pick the hat. 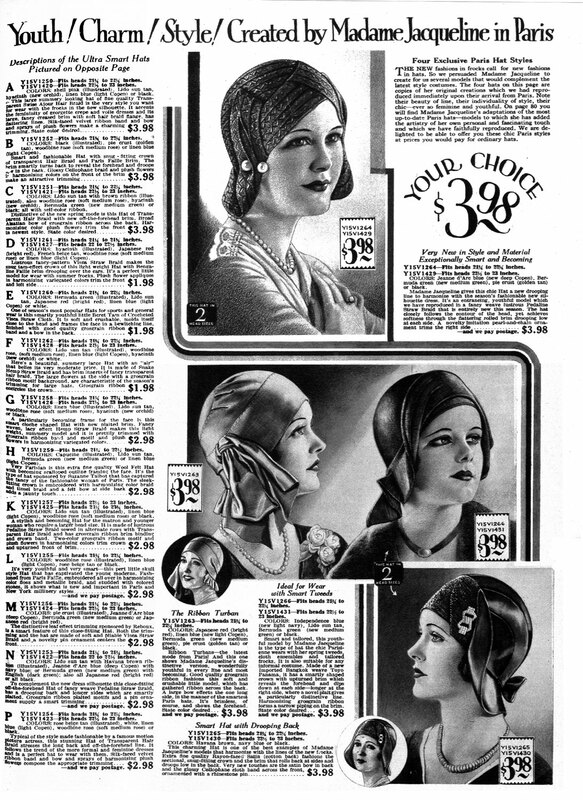 It’s a shame our modern age has really lost the art of beautiful head wear like those that were so widely available in the past. 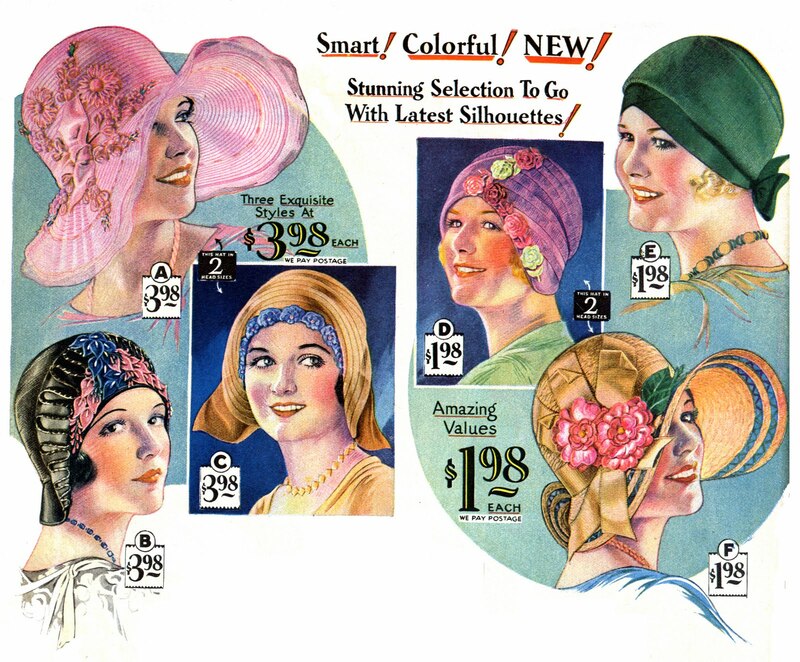 When I got this catalog from 1930 recently I literally swooned over the colors and the creative millinery. I love that these hats are quite literally fanciful sculptures for the head. 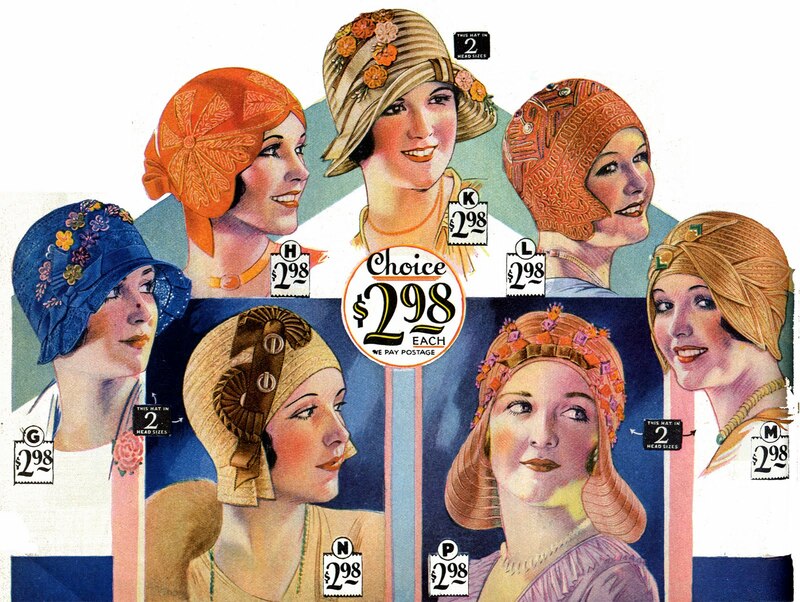 I can tell you, I would certainly have been in trouble if this catalog had showed up at my door back in 1930- I would have scraped and saved my pennies for a dainty chapeau! Speaking of cost, if you’re every curious about how the cost of items in old catalogs relate to modern standards, check out a handy inflation calculator. Sometimes (like pricing things from old Vogues) the prices literally make you gasp, while at other times they make me wish for a magical time machine even more! But with some of the most pricey hats at just a bit over $50, they still seem like a steal compared to modern prices of dainty hats from the early 30s that have survived until today! If you’re looking for stunning vintage hats with a similar feel The Butlers Cottage on Etsy has some droolworthy pieces. >thanks for sharing these, they are amazing! >Oh you literally have read my mind with this post. I'm over the moon for hats from the early 30s and am trying to save up for one (a repro). The best I've seen are the ones made by Behida over at Yellowfield7 on Etsy. Swoon! http://www.etsy.com/shop/yellowfield7. In the mean-time, I was lucky enough to get a vintage one of those wide horsehair ones for $20!! Hats, glorious hats! >I love looking at hats & even seeing people wear them. I feel so odd wearing a hat though. Even a ball cap. I'll wear a visor on the golf course, but as soon as we're back in the car I take it off. Hats are beautiful but I just haven't mastered wearing one. >I love wearing hats! Hats are fab! I do tend to get a lot of stares when I wear one though, people look at me as if I have suddenly sprouted 3 heads.